The IN74ACT164 is identical in pinout to the LS/ALS164, HC/HCT164. The IN74ACT164 may be used as a level converter for interfacing TTL or NMOS outputs to High Speed CMOS inputs. 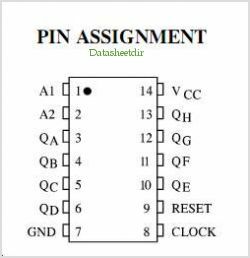 ORDERING INFORMATION IN74ACT164N Plastic IN74ACT164D SOIC The IN74ACT164 is an 8-bit, serial-input to parallel-output shift Register Two serial data inputs, A1 and A2, are provided so that one input may be used as a data enable. Data is entered on each rising edge of the Clock The active-low asynchronous Reset overrides the Clock and Serial Data inputs By Integral Corp. This is one package pinout of IN74ACT164,If you need more pinouts please download IN74ACT164's pdf datasheet. IN74ACT164 circuits will be updated soon..., now you can download the pdf datasheet to check the circuits!